The sheet focuses on a branch of blackberry (Rubus fruticosus L.), curving slightly under the weight of the mass of berries, though the early collector's number 133 inscribed twice on the drawing shows that he was not sure which way up the sheet should be. In the upper part of the sheet is a smaller study of a plant of the pea family (Fabaceae), probably bird's-foot trefoil (Lotus corniculatus L.). 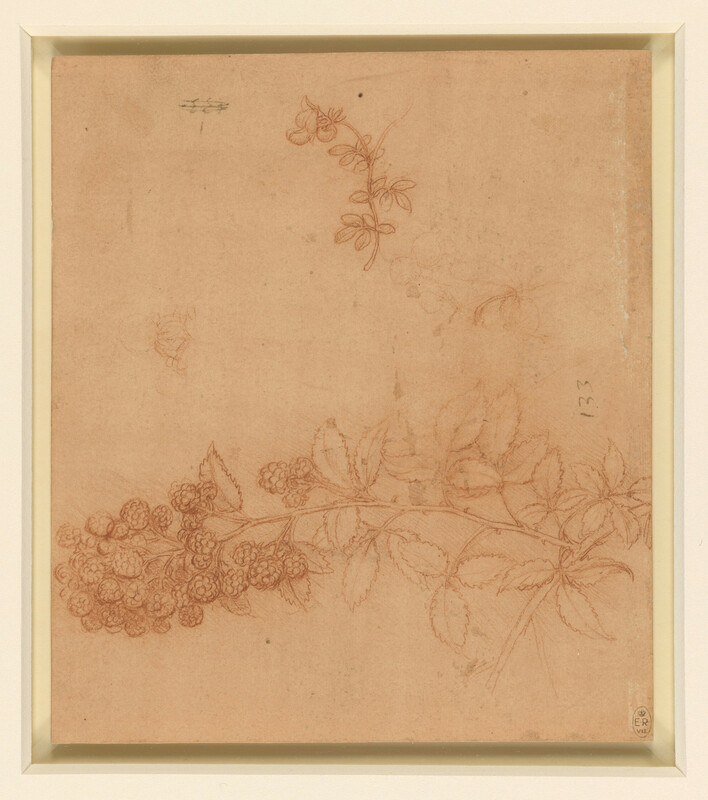 In the years after 1505 Leonardo produced a number of delicate drawings of plants and flowers, mostly drawn with a sharpened red chalk on paper coated with a delicate pale red preparation, itself probably composed of ground red chalk. These studies were apparently prompted by his work towards a painting of Leda and the Swan (see preparatory studies at 912337, 912516, 912518). This was to depict the myth of Leda, the wife of Tyndareus, King of Sparta, who was seduced by Jupiter in the form of a swan and bore two eggs, from which hatched Helen of Troy, Clytemnestra, and Castor and Pollux. Leonardo intended the Leda to have a foreground teeming with plants and flowers, emphasising the fecundity inherent in the subject matter. Over the next decade Leonardo executed a painting of the standing Leda, which soon entered the French royal collection but was apparently destroyed around 1700. Several painted copies of the composition are known, which agree in the form of the central group but differ in the backgrounds, suggesting that they were made from a cartoon in which the background was barely indicated, rather than from the finished panel. It is not however possible to identify either plant on the present drawing in the known copies after the lost painting of Leda: perhaps Leonardo made the drawing and then decided not to use it in the composition, or his botanical studies grew to be independent of the painting and were pursued simply out of curiosity – a common phenomenon in Leonardo’s career. On the reverse of the sheet is a sketch of a man's features in profile to the right, probably by an assistant rather than by Leonardo himself.